This file describes the C++ interface to the expat library used by COPASI. Created for COPASI by Stefan Hoops 2003 Copyright Stefan Hoops CExpatTemplate class. 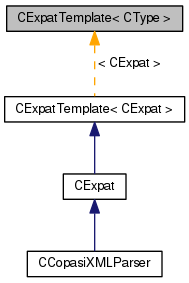 The class CExpatTemplate is a template defining a C++ interface to the expat library. Definition at line 40 of file CExpat.h. Definition at line 65 of file CExpat.h. Definition at line 72 of file CExpat.h. Definition at line 776 of file CExpat.h. Referenced by CExpatTemplate< CExpat >::enableCharacterDataHandler(). Definition at line 803 of file CExpat.h. Referenced by CExpatTemplate< CExpat >::enableCommentHandler(). Definition at line 79 of file CExpat.h. Definition at line 836 of file CExpat.h. Referenced by CExpatTemplate< CExpat >::enableDefaultHandler(). Definition at line 54 of file CExpat.h. Referenced by CExpatTemplate< CExpat >::create(), and CExpatTemplate< CExpat >::~CExpatTemplate(). Definition at line 298 of file CExpat.h. Definition at line 244 of file CExpat.h. Definition at line 266 of file CExpat.h. Definition at line 309 of file CExpat.h. Definition at line 424 of file CExpat.h. Definition at line 233 of file CExpat.h. Definition at line 287 of file CExpat.h. Referenced by CExpatTemplate< CExpat >::enableCdataSectionHandler(). Definition at line 413 of file CExpat.h. Referenced by CExpatTemplate< CExpat >::enableDoctypeDeclHandler(). Definition at line 223 of file CExpat.h. Referenced by CExpatTemplate< CExpat >::enableElementHandler(). Definition at line 371 of file CExpat.h. Referenced by CExpatTemplate< CExpat >::enableNamespaceDeclHandler(). Definition at line 326 of file CExpat.h. Definition at line 382 of file CExpat.h. Definition at line 255 of file CExpat.h. Definition at line 337 of file CExpat.h. Definition at line 276 of file CExpat.h. Definition at line 402 of file CExpat.h. Definition at line 213 of file CExpat.h. Definition at line 360 of file CExpat.h. Definition at line 348 of file CExpat.h. Definition at line 392 of file CExpat.h. Definition at line 824 of file CExpat.h. Referenced by CExpatTemplate< CExpat >::enableEndCdataSectionHandler(). Definition at line 965 of file CExpat.h. Referenced by CExpatTemplate< CExpat >::enableEndDoctypeDeclHandler(). Definition at line 763 of file CExpat.h. Referenced by CExpatTemplate< CExpat >::enableEndElementHandler(). Definition at line 919 of file CExpat.h. Referenced by CExpatTemplate< CExpat >::enableEndNamespaceDeclHandler(). Definition at line 852 of file CExpat.h. Referenced by CExpatTemplate< CExpat >::enableExternalEntityRefHandler(). Retrieve the attribute value for the given name out of the list of attributes. If required is true and the attribute is not found an exception is thrown. If required is false and the attribute is not found NULL is returned. Definition at line 685 of file CExpat.h. Referenced by CExpatTemplate< CExpat >::getAttributeValue(). Retrieve the attribute value for the given name out of the list of attributes. If the attribute is not found default is returned. Definition at line 711 of file CExpat.h. Definition at line 203 of file CExpat.h. Definition at line 490 of file CExpat.h. Definition at line 460 of file CExpat.h. Definition at line 480 of file CExpat.h. Referenced by CCopasiXML::load(), and CConfigurationFile::CXML::load(). Definition at line 470 of file CExpat.h. Referenced by CExpatTemplate< CExpat >::getAttributeValue(), CCopasiXML::load(), and CConfigurationFile::CXML::load(). Definition at line 435 of file CExpat.h. Referenced by CExpatTemplate< CExpat >::getErrorString(). Definition at line 445 of file CExpat.h. Definition at line 453 of file CExpat.h. Definition at line 510 of file CExpat.h. Definition at line 521 of file CExpat.h. Definition at line 500 of file CExpat.h. Definition at line 550 of file CExpat.h. Definition at line 566 of file CExpat.h. Definition at line 586 of file CExpat.h. Definition at line 578 of file CExpat.h. Definition at line 671 of file CExpat.h. Definition at line 542 of file CExpat.h. Definition at line 641 of file CExpat.h. Definition at line 596 of file CExpat.h. Definition at line 741 of file CExpat.h. Definition at line 558 of file CExpat.h. Definition at line 616 of file CExpat.h. Definition at line 572 of file CExpat.h. Definition at line 662 of file CExpat.h. Definition at line 535 of file CExpat.h. Definition at line 633 of file CExpat.h. Definition at line 625 of file CExpat.h. Definition at line 650 of file CExpat.h. Definition at line 135 of file CExpat.h. Referenced by CAnnotation::isValidXML(), CCopasiXML::load(), and CConfigurationFile::CXML::load(). Definition at line 194 of file CExpat.h. Definition at line 790 of file CExpat.h. Referenced by CExpatTemplate< CExpat >::enableProcessingInstructionHandler(). Definition at line 878 of file CExpat.h. Referenced by CExpatTemplate< CExpat >::enableSkippedEntityHandler(). Definition at line 814 of file CExpat.h. Referenced by CExpatTemplate< CExpat >::enableStartCdataSectionHandler(). Definition at line 950 of file CExpat.h. Referenced by CExpatTemplate< CExpat >::enableStartDoctypeDeclHandler(). Definition at line 750 of file CExpat.h. Referenced by CExpatTemplate< CExpat >::enableStartElementHandler(). Definition at line 906 of file CExpat.h. Referenced by CExpatTemplate< CExpat >::enableStartNamespaceDeclHandler(). Convert an attribute of type xs:boolean to bool. If attribute is NULL false is returned. Definition at line 728 of file CExpat.h. Definition at line 892 of file CExpat.h. Referenced by CExpatTemplate< CExpat >::enableUnknownEncodingHandler(). Definition at line 933 of file CExpat.h. Referenced by CExpatTemplate< CExpat >::enableXmlDeclHandler(). Definition at line 48 of file CExpat.h. Referenced by CExpatTemplate< CExpat >::create(), CExpatTemplate< CExpat >::destroy(), CExpatTemplate< CExpat >::enableCdataSectionHandler(), CExpatTemplate< CExpat >::enableCharacterDataHandler(), CExpatTemplate< CExpat >::enableCommentHandler(), CExpatTemplate< CExpat >::enableDefaultHandler(), CExpatTemplate< CExpat >::enableDoctypeDeclHandler(), CExpatTemplate< CExpat >::enableElementHandler(), CExpatTemplate< CExpat >::enableEndCdataSectionHandler(), CExpatTemplate< CExpat >::enableEndDoctypeDeclHandler(), CExpatTemplate< CExpat >::enableEndElementHandler(), CExpatTemplate< CExpat >::enableEndNamespaceDeclHandler(), CExpatTemplate< CExpat >::enableExternalEntityRefHandler(), CExpatTemplate< CExpat >::enableProcessingInstructionHandler(), CExpatTemplate< CExpat >::enableSkippedEntityHandler(), CExpatTemplate< CExpat >::enableStartCdataSectionHandler(), CExpatTemplate< CExpat >::enableStartDoctypeDeclHandler(), CExpatTemplate< CExpat >::enableStartElementHandler(), CExpatTemplate< CExpat >::enableStartNamespaceDeclHandler(), CExpatTemplate< CExpat >::enableUnknownEncodingHandler(), CExpatTemplate< CExpat >::enableXmlDeclHandler(), CExpatTemplate< CExpat >::getBuffer(), CExpatTemplate< CExpat >::getCurrentByteCount(), CExpatTemplate< CExpat >::getCurrentByteIndex(), CExpatTemplate< CExpat >::getCurrentColumnNumber(), CExpatTemplate< CExpat >::getCurrentLineNumber(), CExpatTemplate< CExpat >::getErrorCode(), CExpatTemplate< CExpat >::getInputContext(), CExpatTemplate< CExpat >::parse(), and CExpatTemplate< CExpat >::parseBuffer().